the need for a society dedicated to Autonomic Neuroscience as it was felt that this area was poorly represented by the International Brain Research Organisation (IBRO). the identification of leading autonomic researchers worldwide that would contribute to such an organisation. the organisation of an international conference to inaugurate the society and elect an international executive to take over from the interim executive. establishing efficient means of communication between the interim executive and eventually all members of the society. the possibility of the Journal of the Autonomic Nervous System become the official Journal of the Society. At this original meeting John Furness brought his colleague, Joel Bornstein, into the group and suggested that Jim Angus should also be invited to join. 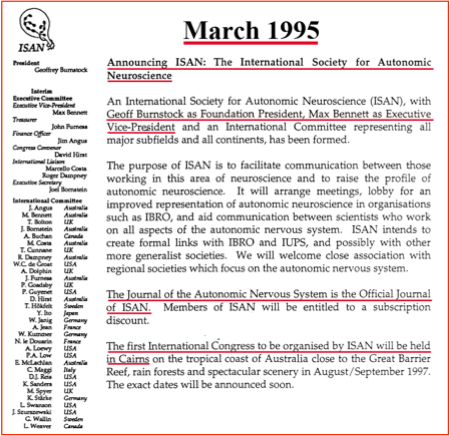 Max Bennett presented the Statutes and By-Laws of IBRO at the meeting for the purposes of setting up what he suggested should be called the International Society for Autonomic Neuroscience (ISAN). It was decided at this fist meeting in Melbourne that Geoff Burnstock be approached to become President, and that the executive would consist of Max Bennett (Executive Vice-President), Joel Bornstein (Executive Secretary), John Furness (Treasurer), David Hirst (Conference Convenor) and Jim Angus (Finance Officer). The ISAN Interim Executive Committee was thus bootstrapped into existence. [derived from a history by MR Bennett]. The existence of the society was proposed by Australian Autonomic Neuroscientists at a meeting on July 2nd 1994 and formally constituted in March 1995 with Geoff Burnstock elected as the Foundation President [personal communication; G Burnstock]. The Journal of the Autonomic Nervous System was established in 1979 with Chandler Mac Brooks as founding Editor-in-Chief (1979 – 1985), Kiyomi Koizumi as assistant editor and a further 26 editors. Geoff Burnstock became Editor-in-Chief in 1985, with the number of Assistant Editors and Editors growing as the journal grew. In 1995 Philip Low was appointed to act as a Clinical Editor to reflect the increasing number of good clinical papers submitted, and the journal also became the became the official journal for ISAN. In 2000, the name of the journal was changes to AUTONOMIC NEUROSCIENCE: BASIC AND CLINICAL to reflect the policy to provide a publication venue that brought together basic science and clinical medicine. The Editorial Board was increased to 50 members. Subsequently, a Review Editor was appointed and the journal started publishing Special Issues, edited by leading international figures. For about the first 15 years of the society, the society was maintained through the University of Syndney and the generous voluntary assistance of John Dodson using the domain name isanweb.org. In 2013, we switch to a commercial provider, now using autonomicneuroscience.info; however, we wish to acknowledge and thank John and his colleagues for the many years over which they have inconspicuously but greatly helped the society.